In 1945, during the second of his six terms as representative from Ridgefield in the General Assembly, Peter McManus helped draft the State Labor Relations Act. The Republican’s post that year as chairman of the House labor committee was rated the “toughest assignment” of the session by a Hartford newspaper columnist. The act established a three-member Board of Labor Relations, aimed at protecting the rights of citizens to join unions and bargain collectively. When Governor Raymond E. Baldwin was ready to sign the bill, he called McManus and other sponsors to the ceremony. It was April 12, 1945. Just then the phone rang with news of Franklin Roosevelt's death, and the signing was postponed. McManus often observed in later years that he had an edge of Democrats who didn’t remember the exact date on which President Roosevelt died. Once the bill became law, the governor named McManus to the board, a post the Republican held through Democratic and Republican administrations until his retirement in 1967. McManus eventually started his own construction company, and many men who were to become top carpenters in town got their training under him, including Dan Tobin, Terry Knoche, Gus Venus, and John P. Leary. McManus served six terms in the Connecticut legislature from 1941 until 1953, and was also on the Board of Assessors. 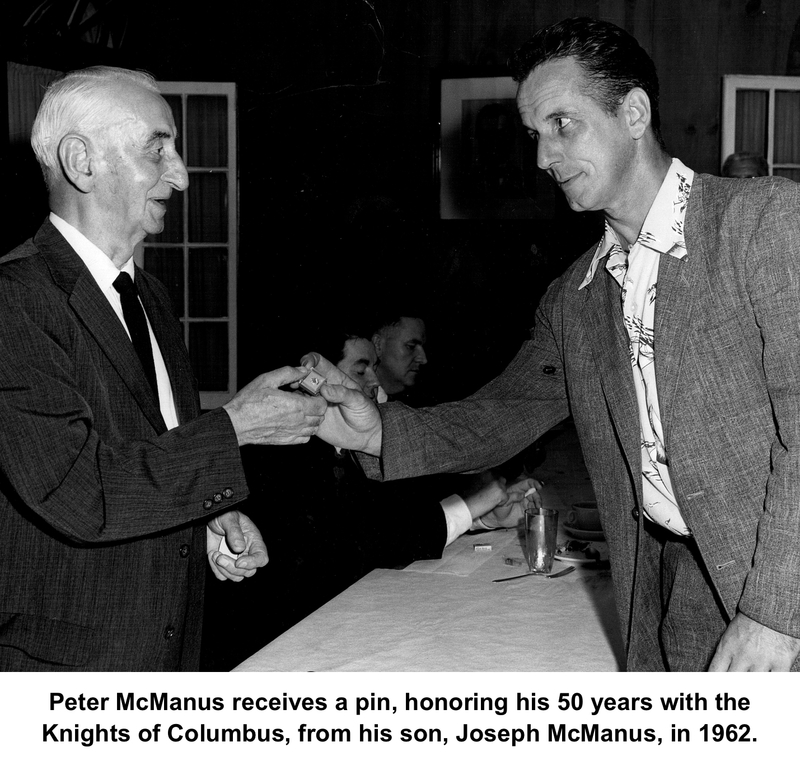 He was active for more than half a century in the Knights of Columbus. Two of his three sons also became active in the community — James, as the town’s building inspector in the 1970s and 80s, and Joseph, as a sheriff and volunteer fireman. He died in 1970 at the age of 80.